Well, The Kids Had Fun…. Every year I fight to downsize Christmas. Christmastime is when my soul craves meaning, peace, spiritual focus. Yet I always end up feeling like I’m beating back a crushing tide of too much: too much to do, too many gifts, too many social obligations. By December 26, even if it’s been a “good” Christmas — and it usually is — I’m exhausted and faintly disappointed that I got sucked under by too much. Again. Anyway, this year, taking inspiration from some other families, I suggested to my husband that we drastically curtail our gift giving and use the money we’d save to take our family on a mini vacation. He had a point, but I was undeterred. Time spent together sharing experiences as a family seemed much more meaningful than gift-wrapped boxes. I pictured us all laughing together, cuddling together, making lasting memories. Despite knowing better, I succumbed to the rosy glow of my imagination and booked our family for a two-night stay at the Highland Lodge in Greensboro, Vermont during a long weekend in January. We’d stayed at the Highland Lodge twice before, but always in summer. In summer we inhabit a small cabin on the Lodge property and spend our days swimming and boating in nearby Caspian Lake. The cabins are closed during the winter months, and Caspian Lake becomes a frozen expanse dotted with ice fishing shanties, so this winter visit promised to be a very different experience. On Saturday morning we crammed our minivan chock full with the ridiculous amount of gear required to spend two nights away with four young children. Thanks to our portable DVD player, the 2.5-hour drive to Greensboro was mostly peaceful. It seemed like the perfect time to get away: my husband had been particularly stressed lately, which concerned me because usually I’m the stressed one. We arrived to find that we were sharing the Highland Lodge’s main building with one elderly couple. All weekend long my husband made references to The Shining, but it wasn’t spooky at all: It was nice not to worry about the girls bothering anybody. Willie and David, the innkeepers, kindly gave us two rooms right next to each other, clear across the Lodge from the other guests. The girls settled in to their room, with all the bossing and bickering that entails. 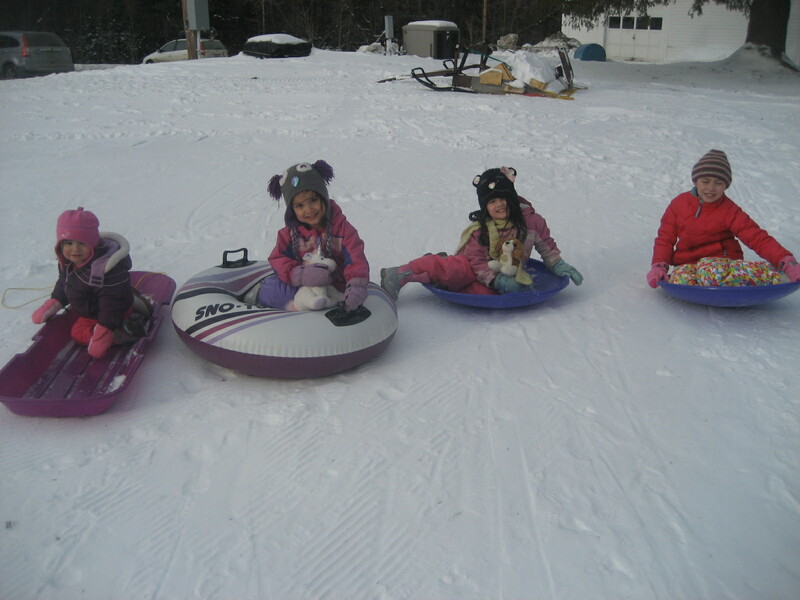 Then we spent a fun afternoon on the Lodge’s excellent sledding hill. I even slipped away for a short run on some of the Lodge’s gorgeous nordic ski trails. The rosy image from my imagination was becoming reality. The call from our dog sitter came just before dinner. Her second time at the kennel, Gracie came down with an intestinal virus and “kennel cough,” so her first day back at home I followed her around cleaning up phlegm. “We’re never boarding her again,” I swore. The next time we went away, we hired a wonderful dog sitter: the son of a friend, an experienced dog watcher, who would stay at our house and care for Gracie. She’d met him only once before, so when he entered our house, she did her usual thing: barked like crazy. When he finally got her out in the yard, Gracie broke through the electric fence and ran away. She spent an entire night outside in snow and sub-freezing temperatures, before returning the next morning. Nevertheless, the dog sitter was undeterred, and so were we. NO problem! I thought, This time we just won’t let her roam the yard. This time, when he’d arrived, Gracie had been so nervous that she’d run around the first floor, peeing. Then she’d bolted up the stairs, jumped the child safety gate, and run down the upstairs hallway, pooping. She’d poop, step in the poop, then try to climb the walls. When our dog sitter managed — miraculously — to get Gracie outside on the tie-out, she yanked her head through her collar and ran away. That’s what we had to deal with, hours into our vacation. We made arrangements: We called in the grandparents. Gracie returned later that night, my parents arrived to let her in the house, and they spent hours scrubbing her bodily fluids off our floors and walls. How do people manage when there aren’t grandparents nearby? Our daughters were up before dawn the next morning, ready for hot chocolate. If that sounds cozy, consider: one daughter doesn’t like hot chocolate, one won’t drink it with marshmallows, one will only drink it with marshmallows, and the baby wants to sit on my lap and pour her hot chocolate all over me. We survived breakfast, and the rest of the day included more sledding, cross country skiing, and a walk on the frozen lake. That evening, daughters successfully tucked into bed, my husband and I settled in the downstairs library to read and munch popcorn. All was peaceful, until I heard what sounded like pounding from upstairs. I mentioned it to my husband, who went to investigate. Remember: We had two bedrooms right next to each other, and we were virtually the only people staying at this lodge in a tiny town in northeastern Vermont. So, did we lock our doors? No! My husband stashed the keys up on our closet shelf. That’s where they were when Georgia, our three-year-old, entered our room and locked the door behind her. Georgia is prone to drama; when I arrived upstairs she was yelling and pounding on the door. “It’s just like in the Alfie book,” I reasoned [the classic Alfie Gets in First by Shirley Hughes, in which Alfie locks himself in his house and the whole neighborhood talks him through unlocking the door.] I had her pull a box of diapers over to the door and stand on it, the better to turn the knob. “I can’t!” she kept crying from atop the diaper box. Finally, my husband took the easy route: he called the innkeepers to find where they kept the extra keys. Georgia was released, and to this day maintains that she never locked the door. “It was my unicorn’s fault,” she insists. Vacation was almost over; in a few short hours, we’d drag our exhausted selves back to whatever horrific scene awaited us at home. -Always maintain control of the hotel room keys. -Contact the vet about anti-anxiety medication for Gracie. -When “vacationing” with young children, the expectation should be no higher than that the kids have fun. That’s good enough.